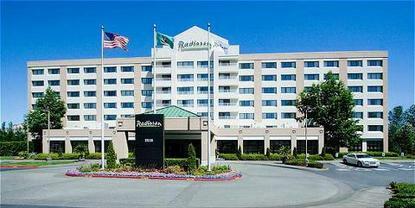 Radisson Hotel Gateway Seattle-Tacoma Airport is directly across from the airport entrance, approximately a 10-minute walk or two-minute shuttle ride from the terminal, and 15 miles from downtown Seattle. Hotel amenities include the indoor pool, whirlpool, sauna, fitness room, business center, two-sided fireplace in the lobby, and Gateway Grille. The hotel also offers room service, free parking, laundry facilities, complimentary wireless Internet access, concierge assistance, and complimentary 24-hour airport shuttle service. All rooms feature complimentary wireless Internet access, desks and ergonomic chairs, armchairs and ottomans, individual climate control, coffeemakers, cable tv, in-room movies, dual-line telephones, irons and ironing boards, and hairdryers.